Starz issued a renewel for Ash Vs. Evil Dead Season 3 back in October, but there hasn't been much else revealed about the series recently. That all changed when series star Bruce Campbell took to social media to showcase the first set photo from Season 3, which reveals that Ash has certainly not been taking it easy since Season 2. 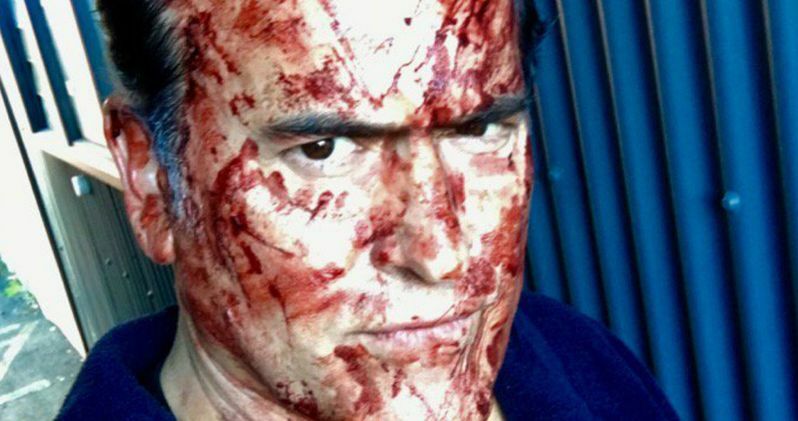 The photo features the actor's blood-splattered face, with the simple caption, "You should see the other guy #AVED3." Now that production is under way, hopefully this will be the first of many photos from the Ash vs. Evil Dead set. Bruce Campbell revealed the photo on Twitter, although we don't get a good look at the set he was on, but it's clear that the scene he was just filming featured some sort of battle, due to all of the blood caked on his face. What isn't clear is where this season will be set. The second season kicked off with Ash (Bruce Campbell) living the high life in Jacksonville, Florida, but Ash is soon summoned back to his hometown of Elk Grove, Michigan. By the end of Season 2, Ash was able to defeat the new villain Baal, while managing to resurrect Pablo (Ray Santiago), who was killed by Baal a few episodes before the finale. With all of that being said, it remains to be seen if Ash will stick around in Elk Grove, or if he will return to Jacksonville. After travelling back in time to 1982 at the end of last season, Ash Williams was greeted with a hero's welcome. It seems likely that Ash may be sticking around in Elk Grove, since a post-credit scene in the Season 2 finale showed a mysterious person picking up the Necronomicon from the remains of the cabin. While Baal and Ruby, along with their spawns, were seemingly banished to the Underworld in the finale, an alternate version of Ruby (Lucy Lawless) was seen watching Ash from afar. As of now, only one new cast member has been revealed for this season. Arielle Carver-O'Neill signed on to play a new character called Brandy, who is described as "a smart middle-class American high school senior whose life is up-ended when she finds herself caught up in violent demonic events." Lee Majors has confirmed that he will be back as Ash's Dad Brock Williams, who was not too thrilled about his son's return at the beginning of Season 2. Majors pretty much looked down for the count midway through Ash Vs. Evil Dead, but if you watch the show, you know anyone can pop back up at anytime, and that seems to be happening here. Brock returned as a ghost at the end of Season 2. If the story continues in Elk Grove, it's possible that Ted Raimi and Michelle Hurd could also return as Chet Kaminski, Ash's childhood best friend who died yet came back as a ghost alongside Brock, and Linda, Ash's high school love, who could pop up from the grave yet again. Sam Raimi serves as Executive Producer with Rob Tapert (Evil Dead, Spartacus, Xena: Warrior Princess), Bruce Campbell (Evil Dead, Burn Notice) and Ivan Raimi (Drag Me To Hell, Spider-Man 3) along with Craig DiGregorio (Workaholics, Chuck) who serves as Executive Producer/Showrunner. Aaron Lam (Spartacus) and Moira Grant (Spartacus) serve as Producers. The last two seasons of Ash Vs. Evil Dead have premiered in October on Starz, although the network hasn't revealed a premiere date for the new season quite yet. While we wait for more details, take a look at the first Ash Vs. Evil Dead Season 3 photo.